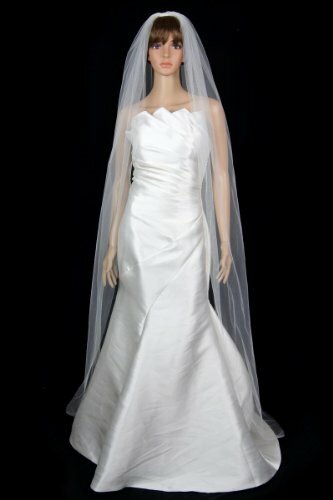 Gorgeous brand new 1 Tier Chapel Length veil with 72in width in fullness. The edge is beautifully finished with Standard Cut Edge. The material is soft and flowing, allowing the veil to drape perfectly.The veil has Silver wire comb attached - wire combs are more pliable and versatile, it can be contoured to your head shape and can be pinned if necessary (as opposed to plastic, which is thicker, inflexible and more cumbersome). Due to variations in computer screen settings, the color may appear differently than the actual color of the veil.Please order our color swatch so you can be confident that you are getting the veil color which matches your dress. If you have any questions about this product by Velvet Bridal, contact us by completing and submitting the form below. If you are looking for a specif part number, please include it with your message.